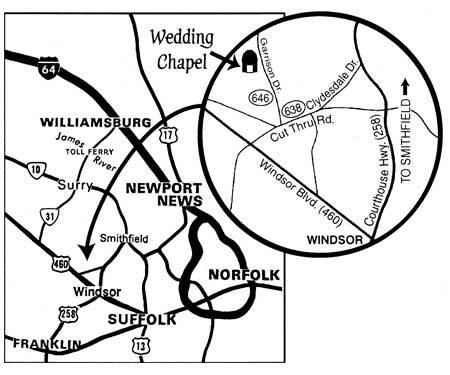 We are located in historical Isle of Wight County, Virginia just west of the Town of Windsor and south of Smithfield Virginia and are within one hour of Virginia Beach and Richmond. The Chapel is situated on several acres of pristine, gorgeous country with beautiful views and gardens. Please make an appointment prior to driving to the Chapel. Thank you. Travel west on Windsor Blvd (Hwy 460) for two miles. Turn left on Garrison Drive (Rt 646). and travel for 1 mile. Travel south on Courthouse Hwy (Hwy 258). Turn right on Cut Thu Road (Rt 638) and travel for 1 mile. Turn right on Garrison Drive (Rt 646) and travel for 1 mile. Please make an appointment prior to driving to the Chapel. Thank you.